CONTRIBUTED PHOTOS | Above, front row, from left, are Nick Zeno, Liam Burk, Giovanni Beato, Dayna Hughes, Sylvia Tsarnas, Sophia Sdregas, Serena Grenga, Sophia Graziano and Jenna Hughes. Second row, from left, are Andrew Kali, Braden Joss, Stephen Yerian, Dominic Graziano, John McNally, Natalie Filisky, Helen Four and Sophia Diorio. Top row, from left, are William Desmond; Jason Vuksanovich; Ella Szalay; Kathy Stoops, principal; Delaney Savaet; George Gabriel; Aidan Markey; the Rev. Connell; Jillian Zidian; and Liberty Lavelle. 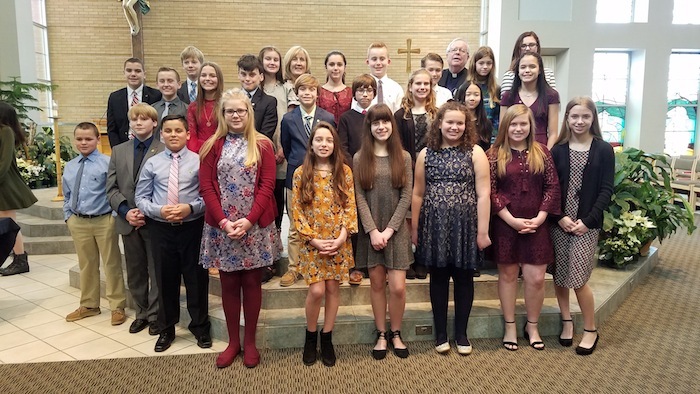 Holy Family students from grades six, seven and eight were recently inducted into the National Junior Beta Club at Holy Family School in Poland. The club is a scholastic, service and leadership organization in which members strive to be of service to their school, community, state and nation. The five candles used during the ceremony, were white for light, purity and faith; red for love, wisdom and bravery; blue for truth, constancy and fidelity; black for dignity, restraint and seriousness; and gold for warmth, friendliness and faithfulness. Members are pinned by parents, grandparents or older siblings. Above, front row, from left, are Nick Zeno, Liam Burk, Giovanni Beato, Dayna Hughes, Sylvia Tsarnas, Sophia Sdregas, Serena Grenga, Sophia Graziano and Jenna Hughes. Second row, from left, are Andrew Kali, Braden Joss, Stephen Yerian, Dominic Graziano, John McNally, Natalie Filisky, Helen Four and Sophia Diorio. Top row, from left, are William Desmond; Jason Vuksanovich; Ella Szalay; Kathy Stoops, principal; Delaney Savaet; George Gabriel; Aidan Markey; the Rev. Connell; Jillian Zidian; and Liberty Lavelle. Below, Jack Desmond, eighth-grade National Beta Club member, pins younger brother, William Desmond, a sixth-grader. May 27, 2011 4:13 a.m.